The new Butyrskaya station opens at the Lyublinsko-Dmitrovskaya Line. A newly-build section of the Lyublinsko-Dmitrovskaya line of the Moscow Metro from the Maryina Roshcha station to the Petrovsko-Razumovskaya station has been put into operation on Sept. 16. Moscow mayor Sergey Sobyanin took part in the opening ceremony. As the mayor announced, "the Butyrskaya and Fonvizinskaya stations have also been opened to the public." The new section of the line is five kilometers long. 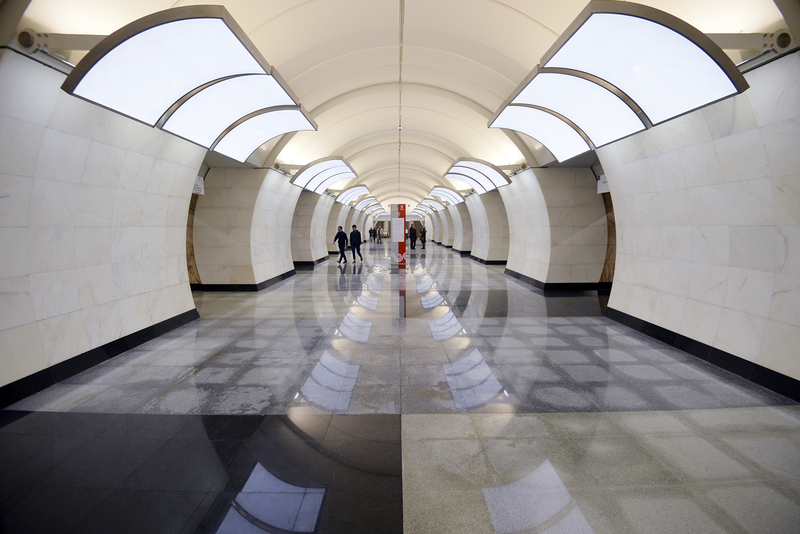 The mayor congratulated Muscovites on the opening of the new underground stations and thanked the construction workers for completing such a challenging task. The new section of the line is 60 meters deep. Now, the total length of the Moscow Metro lines has reached 340 kilometers, while the number of stations has increased to 203. "Today is a big day for the subway and the city, because the northern section of the Lyublinsko-Dmitrovskaya line is being put into operation," Sobyanin said at the opening ceremony. He noted that the construction work had begun a quarter of a century ago, but it had been stalled due to difficult geologic conditions, and had resumed only a few years ago. The mayor also said that by launching this extension, subway transportation was now within walking distance for 240,000 Muscovites, at the same time passenger volume would be alleviated on the Serpukhovsko-Timiryazevskaya line, making the situation easier. The mayor took a ride on the new line and after getting off at the Petrovsko-Razumovskaya station, he had a chat with the public. The Butyrskaya station is located at the intersection of Rustaveli Street and Ogorodny Lane, the Fonvizinskaya station is at the beginning of Milashenkova Street, while the Petrovsko-Razumovskaya station is situated near Dmitrovskoye Highway. At Petrovsko-Razumovskaya, a cross-platform junction to the Serpukhovsko-Timiryazevskaya line has been constructed so now passengers won’t have to go to another platform to take a train going in the same direction. The next section of the Lyublinsko-Dmitrovskaya line up to the Seligerskaya station will be inaugurated in 2017 and it will consist of three stations. By year end 2016, or at the start of 2017, three new stations are planned to be launched on the Kalininsko-Solntsevskaya line from the Park Pobedy station to the Ramenki station. The first section of the Third Interchange Contour from the Petrovsky Park station to Delovoy Center including the CSKA, Khoroshevskaya and Shelepikha stations will also be opened.